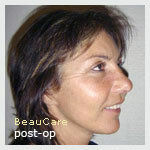 The featherlift or aptos lift is a safe and renewing rejuvenation technique. Thanks to this effective technique one gets youthful results in a short period of time without scars and a long drawn out recovery. The featherlift takes approximately one hour. Due to the fact that the featherlift is done under local anaesthetic you may go home on the very same day. After a few days you are able to resume your daily activities. 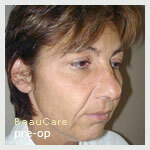 The scars of an aptos lift, featherlift or contour thread-lift fade quickly and become semi-visible. It is therefore a safe, effective procedure without a long recovery period.